Our customers have always relied on us to provide the highest quality products built to their exacting specifications. Control Cable recognizes the importance of maintaining certification and registration to a number of industry standards. By adhering to these standards we not only ensure that our products are of the highest quality, but also that we conduct our business with the goal of continuous improvement, cost reduction, and on-time delivery. 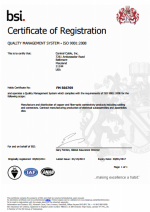 Control Cable’s QMS (Quality Management System) has been certified to the ISO 9001:2015 and the AS9100D standards. Initial certification and sustaining auditing services are conducted by BSI, a recognized leader in quality standards certification. The widely recognized AS9100D quality management standard is designed to meet the stringent, complex and unique demands encountered in the aerospace and defense industries. AS9100D goes beyond the requirements of ISO 9001:2015 by defining 100 additional requirements that are critical to aerospace and defense customers, including focus on areas directly impacting product safety and reliability such as configuration management, purchasing controls, product realization, monitoring, and measurement. View a copy of our certificate here. Control Cable is registered with the US State Department as an ITAR registered supplier. This allows us to produce products and OEM assemblies for customers where ITAR regulation management and control are required. International Traffic in Arms Regulations (ITAR) is a United States Federal Government regulation to control the manufacture, export, and transfer of military and defense technologies, information and services. Any person or U.S. company who wishes to engage in the manufacture and export of articles under the United States Munitions List (USML) must register with the United States Department of State to obtain certification under ITAR. Companies receiving this certification demonstrate that they have the knowledge and understanding to fully comply with the Arms Export Control Act (AECA) and International Traffic in Arms Regulations, as well as having corporate procedures and controls in place to ensure compliance. All of our assemblers are certified to the WHMA/IPC-A-620 standard- an industry-wide collection of acceptance criteria for the manufacture and inspection of soldered, mechanically secured, or crimped interconnections associated with cable and harness assemblies. We provide ongoing education to the standard with our on-staff certified IPC trainer. Control Cable is proudly veteran-owned and supports the hiring of veterans whenever possible.